Chita Rivera, Debra Monk and Karen Ziemba – three beloved actresses well-known for their work in Kander and Ebb musicals – will be joined by other stars, including Heidi Blickenstaff ([title of show], LITTLE MERMAID) and host David Hyde Pierce (Tony Award-winner star of Kander and Ebb’s CURTAINS) to pay tribute to John Kander and the works of Mr. Kander and his late collaborator Fred Ebb when the Pulitzer Prize and Tony Award-winning Vineyard Theatre honors John Kander at its annual Vineyard Theatre Gala on Monday, March 8 at the Hudson Theater (145 West 44 Street) in Manhattan, it has been announced by Douglas Aibel, Artistic Director of Vineyard Theatre. As well, Mr. Aibel announced that tickets for the performance and a 7:30pm cocktail reception are now on sale. Tickers are $95. Vineyard Theatre honors John Kander as it prepares the world-premiere of the musical THE SCOTTSBORO BOYS — with music and lyrics by John Kander & Fred Ebb, book by David Thompson, and direction and choreography by Susan Stroman – beginning previews on February 12 and opening March 10 at Vineyard Theatre (108 East 15 Street). THE SCOTTSBORO BOYS is a stirring new musical that explores the infamous 1930’s ‘Scottsboro Case’, in which a group of innocent African-American teenagers are falsely accused of a terrible crime — ultimately provoking a national outrage that sparked the American Civil Rights movement. THE SCOTTSBORO BOYS reunites Vineyard Theatre with John Kander, David Thompson and Susan Stroman — who along with the late Fred Ebb — previously collaborated on The Vineyard’s revival of FLORA, THE RED MENACE in 1987. Vineyard Theatre recently released a new block of tickets to THE SCOTTSBORO BOYS. Tickets are now on sale through April 4. Chita Rivera starred in the Kander and Ebb musicals KISS OF THE SPIDER WOMAN (Best Actress Tony Award), CHICAGO and THE RINK (Best Actress, Tony Award). Debra Monk and Karen Ziemba, both Tony-winning actresses, starred in the Kander and Ebb musicals CURTAINS and STEEL PIER. John Kander and Fred Ebb wrote some of the most beloved and enduring musicals in theatre history during their four decade-long partnership, the longest of its kind in musical theatre history. Their works include: FLORA, THE RED MENACE; CABARET (two Tony Awards – Best Musical and Best Composer and Lyricist); ZORBA; CHICAGO (Olivier Award); WOMAN OF THE YEAR (Tony Award, Best Original Score); KISS OF THE SPIDER WOMAN (Tony Award, Best Original Score); CURTAINS; THE VISIT and ALL ABOUT US. Kander and Ebb also collaborated for film and television on such memorable works as LIZA WITH A Z (Emmy Award); HBO’s LIZA MINNELLI’S STEPPING OUT (Emmy Award); the films FUNNY LADY (Oscar nominated for “How Lucky Can You Get”); LUCKY LADY; NEW YORK, NEW YORK; STEPPING OUT and CHICAGO (Oscar nominated for Best Song). They are the recipients of two Grammy Awards – for the Original Cast Album of CABARET and for the Musical Show Album of CHICAGO, and in 1998, they received the Kennedy Center Honors award for Lifetime Achievement. Vineyard Theatre’s Board Chair is Jill S. Gabbe (gabbegroup) and the President is Ken Greiner (Dalton, Greiner, Hartman, Maher & Co). Vice-President and Gala Chair, Rick Dean (Scotia Capital, retired), leads The Vineyard’s Gala Committee, which includes Board members Kathleen Chalfant (Actress), Jane Chesnutt, Dozier Hasty (Everything Brooklyn Media), Richard McCune (City National Bank), David Schwartz (Debevoise & Plimpton), Jeffrey Steinman (Rudin Management), Annette Stover (Euro RSCG Worldwide) and Norma V. Rosenberg (Vistage Group). Vineyard Theatre is the recipient of the Tony Award for the musical AVENUE Q, and continues as producer of the musical’s current production at New World Stages in New York. Additionally, The Vineyard has produced the musical [title of show] on Broadway. 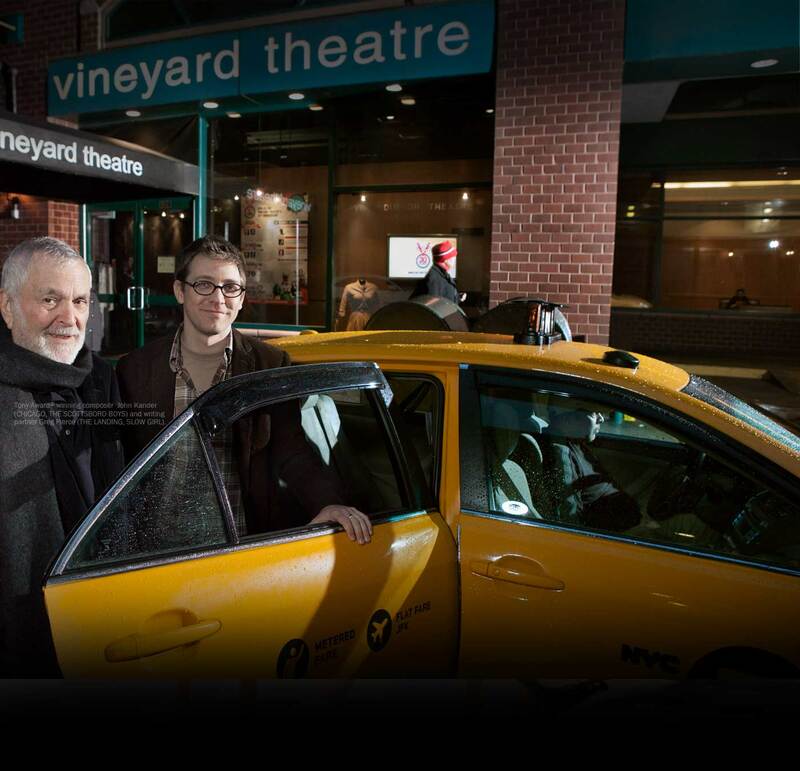 Regarded as one of the nation’s leading non-profit theatre companies dedicated to developing and producing bold new plays and musicals, The Vineyard has produced the Pulitzer Prize-winning productions of Edward Albee’s THREE TALL WOMEN and Paula Vogel’s HOW I LEARNED TO DRIVE. The Vineyard has consistently premiered provocative, groundbreaking works and developed innovative educational collaborations. Recent productions include last season’s acclaimed WIG OUT! by Tarell Alvin McCraney and The Civilians’ THIS BEAUTIFUL CITY. Vineyard Theatre opened its 2009-10 season with the critically acclaimed A BOY AND HIS SOUL, written and performed by Colman Domingo. This spring, in addition to the aforementioned production of THE SCOTTSBORO BOYS, The Vineyard will produce the world premiere of Adam Rapp’s THE METAL CHILDREN and the new musical THE BURNT PART BOYS, by Mariana Elder, Nathan Tysen and Chris Miller, directed by Joe Calarco; which will be a co-production with Playwrights Horizons. Previous Vineyard Theatre Gala honorees include luminaries such as Tony Award winner Marian Seldes (who appeared at The Vineyard in THREE TALL WOMEN); playwrights Edward Albee and Paula Vogel (each who won Pulitzer Prizes for their plays at The Vineyard, THREE TALL WOMEN in 1993 and HOW I LEARNED TO DRIVE in 1998 respectively); Tony nominee Kathleen Chalfant (a member of the theatre’s Board of Directors, and has previously appeared in The Vineyard’s productions of TRUE HISTORY & REAL ADVENTURES and THE PARTY) and Tim Robbins and Susan Sarandon. The Vineyard’s past Galas have also featured performances and special appearances by stars such as Eartha Kitt, Lewis Black, Penny Fuller, John Guare, Julianne Moore, Bart Freundlich, Lili Taylor, Anna Paquin, S. Epatha Merkerson, Judy Kuhn, Cheyenne Jackson, Michael Berresse, Joe Morton, Paul Rudd, Patricia Clarkson, Betty Buckley and the cast of [title of show], among others. The Vineyard’s Gala will be held Monday, March 8th at the Hudson Theatre at the Millennium Broadway Hotel (145 West 44th Street). Tickets for the entire evening – which includes a 6 pm cocktail reception, 7:30 pm dinner and 8:30 pm Gala performance — range from $500-$1,000 and tables from $5,000-$25,000. For ticket information and reservations to the Vineyard Theatre Gala and THE SCOTTSBORO BOYS, call Vineyard box office at 212-353-0303 or visit www.vineyardtheatre.org.